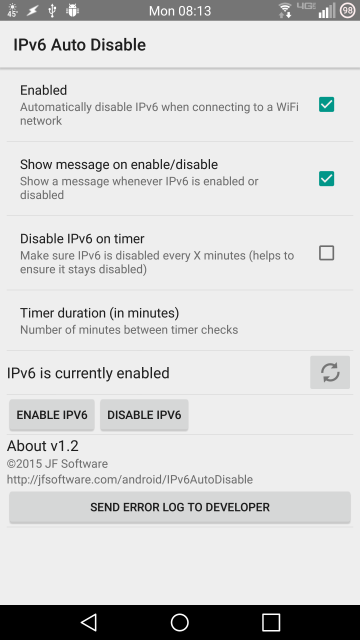 Simple app that automatically disables your phone's IPv6 access whenever you connect to a new WiFi network. In Lollipop (5.0), a bug was introduced to Android on certain devices (such as the Verizon LG G3) that causes connectivity issues on certain WiFi networks. This problem is typically solved by disabling IPv6. Unfortunately, this setting gets reset each time you connect to a new WiFi network, so this app automatically disables this setting each time you connect. Update: Since the 24B software update for the Verizon LG G3 (VS985), this app may no longer be needed as the bug was fixed!